With its fire engine red body and tell-tale “chik-burrrrrrr” call, you would think that our June 2015 bird in our 12 Months of Birding at the Inn blog series — the Scarlet Tanager — would be easy to spot. Think again! This finch-sized warm weather resident of Pisgah National Forest surrounding the Inn on Mill Creek B&B is super stealthy, nesting and hanging out high up in leafy maples, oaks and beech trees, munching on insects. 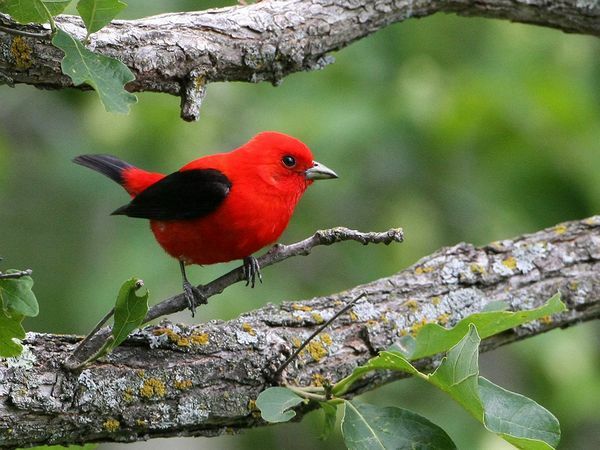 While visiting our North Carolina mountain woods in the spring and summertime, the male Scarlet Tanager is bright red with black wings and a black tail, while the females are an olive green-yellow. The males trade their red feathers for something similar to the females in the fall, after breeding. Scarlet Tanagers spend their winters in the warmer climates of South America, migrating across the Gulf of Mexico, often at night.